mmmmmm....delicious! I'm a toffee lover too! I also love chocolates with nuts!...I always bring it wherever I go.. This would make a very impressive gift for all ages! Toffee & chocolate. Sounds gooey but tasty. Looks delicious...I'm a sucker for some good chocolate covered toffee. I can't say that I have ever had white chocolate covered toffee, I'm a bit skeptical, but I'm sure its good. 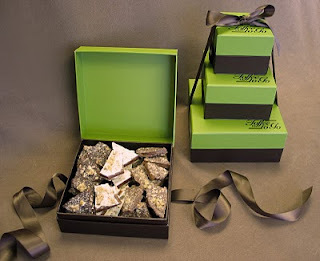 I like the elegant boxes you are using to package your toffee. My favorite local ice cream shop has a toffee chip flavor that is to die for. Toffee to me is like bananas to monkeys. Looks like a great gift. I wonder what it tastes like. wow this would be a perfect gift!